25 Jan 2019 / 11:22 H.
Asia e University (AeU) is one of the premier Open & Distance Learning (ODL) institutions in Asia. It is founded on innovation and technology and has its focus on the digital frontier. The principle behind the establishment is to make education truly democratised, personalised and borderless, and available for all. Among its many programmes is the Master of Information and Communication Technology Management (MICTM). The degree programme is structured to equip students with interdisciplinary skills and offers a reliable link between the dynamics of technology and management in business. It is recommended for IT professionals who will benefit by improving their leadership skills and techniques, plus develop a more strategic approach to deal with today’s tech-savvy organisations. AeU recently celebrated its 8th convocation at the Putra World Trade Centre. Of the 2,669 graduates, 815 students took postgraduate programmes of which seven locals and four international students were MICTM graduates. 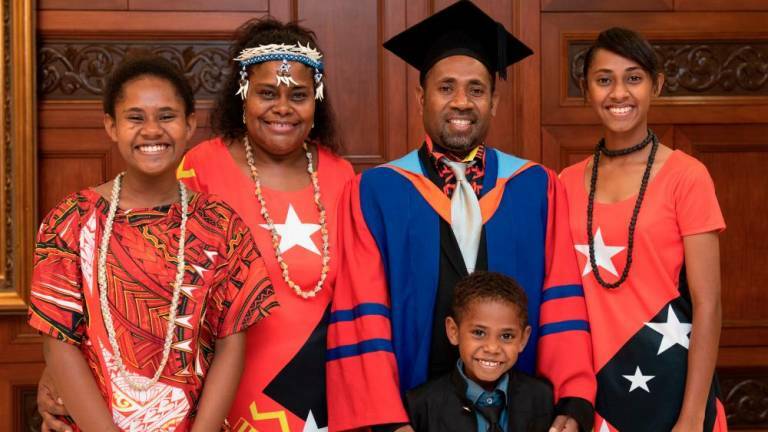 Warren Suti (pix, in graduation attire, with his family) from Papua New Guinea was among the MICTM graduates. A principal project engineer with a government agency in Papua New Guinea; the 44-year-old graduate is a father of three and shared that he chose to take up the programme to upgrade his skills. Additionally, Warren adds that subjects were interesting and very relevant and paramount to his work. He found himself developing more skills and in-depth expertise in information management. “The knowledge I gained continues to be useful and applicable in my current working environment. I was enlightened in many aspects, especially business planning, strategy, legal side of cyber laws which is central to my organisation’s direction,” he adds. “My AeU experiences in the MICTM programme was richly rewarding as it has given me better career prospects and opportunities in starting my own business in future. I have also become a better time manager - managing my work, family obligations and study,” he concludes.